Is the Black Lives Matter UK movement able to comment on the protest last night in Forest Gate? On Twitter you called for people to get down there and many protesters there seemed to have BLM banners etc. Did you organise it? If not, who did? 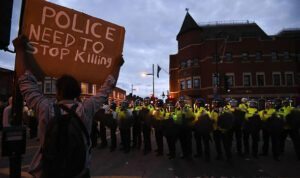 What do you want to say about the violence and arson, and the six injured police and demonstrators that were arrested? What do you want to say to the suggestion that that there is no evidence that Mr Da Costa was killed by the police – rather by drugs he ingested? The IPCC has said reports he suffered a broken neck etc are ‘misinformation’. What do you say to the suggestion that Black Lives Matter UK has caused unrest based on untruths at a time when the UK’s emergency services are under immense strain? Please do respond by 7pm today or perhaps provide a telephone number so I can speak to a representative directly. The first thing to say is we are not BLM UK. We are independent of that organisation as we believe mass action on the streets and in our workplaces is the way forward, not elite direct action by small numbers of committed people doing actions on behalf of others. We believe capitalism is the enemy, not white people. Having said that, we defend the individuals in BLM UK who are being attacked in the mainstream media for the ‘crime’ of having the audacity to call for Justice for Edson. Members of our group (BLMM) did indeed take part in the peaceful protest for Edson, although the Black Lives Matter placards the Daily Mail refers to were from the Stand Up To Racism organisation, which is clear to anyone who takes the time to read the heading on them. The slogan ‘black lives matter’ is common parlance in the anti-racist movement, but this seems to have passed the Daily Mail by. They want to twist everything to fit into their warped Tory-racist view of the world. The supposed journalists at the Daily Mail obviously can’t read. Our response to the Daily Mail’s attempt to undermine Edson’s fight for justice and to protect the racist killers in the police appears below. Yesterday’s explosion of anger in Forest Gate and Stratford was a direct consequence of the death of Edson da Costa, after a police stop. The protest was spontaneously organised by friends of Edson and the Portuguese community in Newham. We hold it as our responsibility, and that of everyone opposed to racism, to support their demands for justice. The focus of any responsible journalist should be on another death added to a very long list of black and ethnic minority deaths in police hands. The disturbances that followed the spontaneous but peaceful protests demanding justice for Edson are being cynically used to distract from the real issue – the deaths of black and other ethnic minorities at the hands of the police and the increasing number of white working-class youth also being targeted for harassment and worse. Family members say the hospital doctor informed them that Edson had a collapsed lung, diaphragm and ruptured bladder. The Independent Police Complaints Commission (IPCC) claim is disingenuously silent on these injuries. The claim that “no serious force was used” is totally implausible and has already further discredited the IPCC. Since 1990, 166 black/ethnic minority persons have died after contact with the police; nine resulted in unlawful killing inquest verdicts. Yet no police officer has been successfully prosecuted since 1969. The IPCC and CPS have no credibility on delivering justice for victims who die in police hands. The inevitable conclusion drawn by the black community is that police institutional racism is rampant and officers know they can act with impunity. In 1996, Ibrahima Sey, who died a short distance away from Forest Gate in Ilford, was found “unlawfully killed” by an inquest jury. The Crown Prosecution Service (CPS) refused to prosecute any officers over the killing. Sey, like Edson, was sprayed with CS gas at close range and his breathing was restricted by use of force, as reported in Edson’s case. It is a scandal that Newham Borough Commander, Ian Larnder, has not suspended the officers concerned. A teacher or social worker facing allegations of violence would be immediately suspended pending investigations. This only reinforces the conclusion that there is no serious intention to deliver justice for Edson. We will continue to support mass community campaigns involving anti-racist organisations, trade unions and community groups supporting the family’s legal case to achieve justice for Edson; we will not be cowed or intimidated by racist reporting. On the contrary, this will only strengthen our determination to help seek justice for Edson and accountability of the police for his death.